Picking the perfect treadmill for your home is a big decision. There are many great reasons for buying a home treadmill, and the Horizon Fitness T91 Treadmill offers so many good alternatives to fighting the weather for outdoor walking, or finding the time to drive to a crowded gym. The Horizon Fitness T91 provides you with an excellent resource for aerobic exercise that can improve your health and tone your body. Walking and jogging are well-known for their weight loss benefits. Walking is a low-impact exercise that has amazing results for those who are dieting and who want to tone muscles. Walking is an excellent exercise for anyone needing to recover from injury or illness as well. The Horizon Fitness T91 Treadmill offers many ways to use the standard treadmill to tailor it to your needs. Walking also provides a great protection against diseases such as cardio problems like heart attacks and strokes, and is also a great stress reliever. Exercise in all of its forms releases endorphins that make you feel exhilarated and happy. It is the body's natural euphoria that makes exercise such an important part of a daily routine. Walking is an exercise you can do every day. Unlike strength training, and strenuous aerobics that require you to rest your body for a day or two between each session, you can walk anytime. In fact, you should, and the Horizon Fitness T91 Treadmill makes it possible. High-Tech Computer: While it isn't strictly necessary, it is certainly helpful to have an onboard to track things like distance, the amount of time you workout, how many calories you burn during each workout, and other aspects that help you. The Horizon Fitness T91 Treadmill has a large, easy to read LCD screen with an orange backlight that makes it stand out. The display relates all of the necessary information to help you review your progress, and analyze your success. Multiple Workout Options: Let's face it, there isn't one particular routine that will work for everyone. And even when a simple routine is enough, you need variety to keep it interesting and keep your muscles from getting used to a routine. The Horizon Fitness T91 Treadmill has 9 programs built-in to develop your own personal exercise routine, and give you the variety you need to stay motivated, and keep your body working at the peak of its ability. 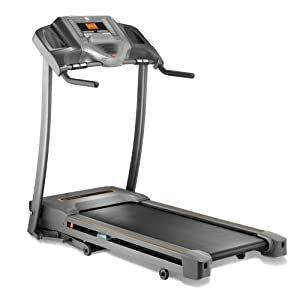 Comfort and Safety: These may not be the first things you consider when looking for a treadmill, but they are very important. A machine that isn't comfortable to use, isn't going to get used. The Horizon Fitness T91 Treadmill has “ComfortZone” air cell cushioning to take the stress off your joints, and make walking and jogging a pleasure. It also has well-laid out design with a wide 20 x 50 inch walkway, and ample room for a long stride so even the tallest person in the family can get a workout comfortably. It also has a dual set of hand grips, one at the side and one in the front to make it perfect for any position. Folding Storage: Unless you have a room dedicated to workout equipment, a good treadmill should store easily. The Horizon T91 folds easily, and has hydraulic shocks that make it easy on your body to fold it and store it comfortably so that your home can stay looking like a home. Capacity and Durability: These are two of the biggest concerns. If you are going to spend money on a big piece of equipment, you need it to last, and you need it to be able to support you during a workout. Small, flimsy machines wobble and shake during a workout even with someone small on them. The Horizon Fitness T91 Treadmill can support up to 275 pounds in a heavy, heart-pounding workout without wobbling and shaking. It will give you a strong, dependable workout in comfort and stability. Johnson Health Tech: Okay, you don't have to look for the name Johnson Health Tech when you are considering a treadmill, but why wouldn't you? Johnson Health Tech is an industry leader with decades of experience and success in delivering the highest quality workout equipment to customers world-wide. 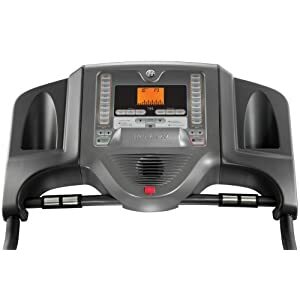 They provide a comprehensive guarantee that gives consumers a lifetime warranty on the frame and motor, and 1 year warranty on parts and labor when they buy the Horizon Fitness T91 Treadmill. Affordability: No one likes to think they judge the important things in their life by the cost, but budget considerations are a reality for most people. The Horizon Fitness T91 Treadmill is a mid-range, affordable piece of gym equipment that will give you the durability and efficiency you need at a price that isn't going to ruin your budget. The Horizon Fitness T91 Treadmill is a great entry level workout machine for someone who wants more than a bare bones treadmill, and has a powered platform so you don't have to manually make it move. It is strong, and durable for the money, and gives a great workout for people of any level of fitness. The Horizon Fitness T91 Tredmill qualifies for the free super saving delivery at Amazon.